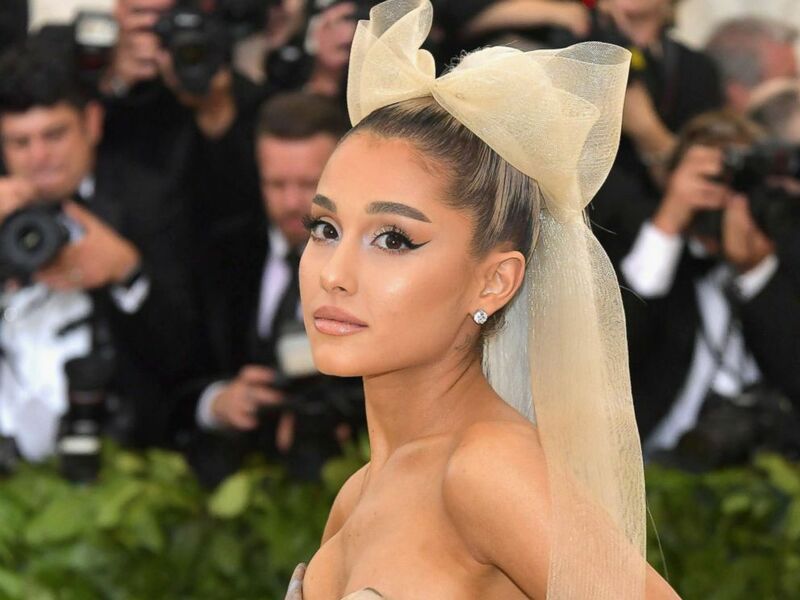 Pop music superstar Ariana Grande said she feels she is now "living her best life," after releasing a new album, performing at the MTV Video Music Awards and becoming engaged to her boyfriend Pete Davidson. The pop music icon opened up about how she was able to heal after a tragedy unfolded at one of her shows a little over a year ago and her upcoming wedding plans with Davidson in an interview with ABC News' Michael Strahan. When asked how she knew Davidson was "the one," Grande said, "it's just like a feeling." "That's so cheesy, like, people are always like, 'When you know, you know,'" she quipped. "And you're like, 'Well, yeah, whatever, okay.'" Still she says, "you just feel it," when you find your soulmate. "He just ticks every box, and just gets better every day ... I'm very grateful for him." Grande said she even included a song entitled "pete davidson" on her new album, "Sweetener." "I didn't know what to call it, cause I was like ...I made it just to, like, send to him, you know, as just like a nice little sentiment," she said. "Like a love letter." "We're so annoying, huh?" she added in jest. When it comes to their wedding, Grande said that she and Davidson are going to "take our time to plan it." "My friends and I, my mom and everybody have been like, brainstorming and ... sharing ideas and stuff," she added. "It's really fun." "I work so much, I've never, like, spent this much time or energy ... planning something personal," she said. "I might cry, I'm just so excited." She adds that the big day will probably be some time next year. Ariana Grande performs onstage during the 2018 Billboard Music Awards at MGM Grand Garden Arena on May 20, 2018 in Las Vegas. Every song on Grande's new album, "Sweetener" is part of her current life story, she said, and she describes the sound as "a little more soulful ... version of pop." "I was so hungry to do something different. I love pop music of course, but my heart and kind of like, soul is more in R&B, you know? I grew up listening to all the 90s divas and ... I've been waiting to do something that was a little more soulful version of pop for a while." "Sweetener was one of the first songs Pharrell [Williams] and I wrote together, and I knew it was gonna be the title from the moment we wrote it," she continued. "All I wanted to represent was a light, fun, sweet presence. And just like, bring a little bit of like, escapism and joy to people's lives when they listen to it. That's why nothing is that sad on the album. I really just wanted to keep it beautiful, and free, and light and sweet." Grande said she chose the cover art for the album, an upside down portrait of herself, as a metaphor for where she was in her life for a period of time. "I wanted to do something weird because I feel like, life was upside down for a little while," Grande said. "I was just like -- I want it to be a very simple portrait of me ... I bleached my hair platinum blonde for it and stuff too, just so that everything could be like, more light and ethereal feeling. Fresh feeling." To give her biggest fans a first look at the new album, Grande has been performing a series of "AmEx Sweetener" sessions, which she describes as "really intimate and chill." During these performances, she says she can see her fans "faces and like, name them based on their username on Twitter." She even says that during her most recent "AmEx Sweetener" session, her very own idol Madonna showed up to "to hang out afterwards." "[Madonna] paved the way for every female artist who's working today," said Grande, who tapped Madonna to be the voice of God on her empowering new single "God Is a Woman." "Everyone who is in the pop game right now is doing something that Madonna probably did first." On May 22, 2017, Grande had just finished performing a sold-out concert at the Manchester Arena in England -- one of the Europe's largest arenas -- when an explosion rocked the stadium. The attack, which authorities said was the work of a suicide bomber, left 22 people dead and dozens injured. In the aftermath of the harrowing incident, Grande has spoken openly about the anxiety she experienced following the terrorist attack, but said she was inspired by her fans and the people of Manchester to continue doing what she loves. Initially, Grande said she "didn't think" she was going to perform again after what had happened at her show. "Just looking at my fans and the way that they responded to it and like, of course the city of Manchester, and how they responded to it, with so much ... unity and strength and love," she said. "I'd just never really seen anything like it." She said that the people of Manchester's "fearlessness" is what inspired her to continue her tour. "Cause I initially ... I went right home, I went to Florida," she recalled. "I was like, 'I can't.' I was like, 'I'm not putting those costumes on again, I can't sing those songs again.'" "I was like, 'There's no way,'" she said, adding, however that, "I was trying to go to sleep that night, and it didn't feel right, it didn't feel like the right decision." She said she eventually spoke to her mother and her manager, telling them, "I think that there's, you know, something more that we should be doing." "I think we should set a better example and kind of like, celebrate their lives, you know what I mean?" she added. "And try to like, not let ... hate or like, violence, or any kind of darkness of that magnitude win in this scenario." The least we can do is just like, keep going, and sing, and love each other, and like, sing louder. She said she felt "the least we can do is just like, keep going, and sing, and love each other, and like, sing louder." Grande returned to performing less than two weeks later, and said that when she went back on tour she initially "didn't think anyone was going to show up at my shows," but adds that "they did." Grande also told Strahan that she will be going on a "Sweetener" tour to perform songs from her new album early next year. Ariana Grande attends the Heavenly Bodies: Fashion & The Catholic Imagination Costume Institute Gala at The Metropolitan Museum of Art on May 7, 2018 in New York. The biggest things that have helped her heal have been the "love from my fans" and "seeing people be there for one another and help each other heal." She adds that "therapy and time" have also aided her along the way. "You find the light eventually," she said. "And it's still, you know, a work in progress ... But I think the sense of community that I saw in response to what happened was, like, the best example of humanity." "We saw the worst possible side of humanity, and then we also saw people come together and turn it into something beautiful and showcase how beautiful people can be to one another," Grande said.